The healthcare community or industry is made up of basically three components. First of all, there are Paymasters or Payors. Paymasters are those who pay for medical or healthcare services. Examples are individuals, employers, insurers and managed care organisations (MCOs). Then there are the Healthcare Providers (HCPs). These are the professionals who dispense medical treatment and services. Examples are General Practitioners (GP), laboratories, hospitals and dentists. Finally, there are the Suppliers. These obviously are the businesses that supply both the Paymasters and Healthcare Providers. Despite being predominantly data-centric, the uptake of IT by the healthcare community has been minimal. Prior to MediNET, no infrastructure exists that allows the components of this community to exchange data in real-time and at the same time streamline their business processes. 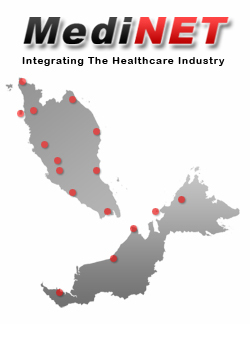 Being a nationwide initiative, MediNET is the platform that integrates the healthcare industry. 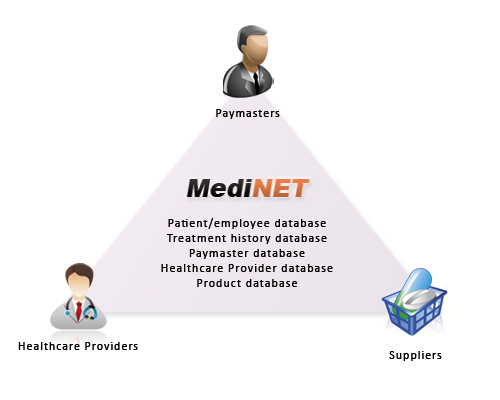 MediNET is a group of interdependent web database applications that is powered by a central database. These component applications are designed to work together so that pertinent information could be shared among each of its user. Thus, MediNET is a virtual conduit for the sharing of management information. The need for MediNET arises because the current practice is only able to make information available 'after-the-fact' - sometimes too long 'after-the-fact'. While traditionally this has been quite acceptable, the pace of modern business mandates that companies must have access to current information 'as-it-happens'. The premise behind MediNET is that if each players within the industry can share information in a timelier manner, all of them would be in better positions to optimise their respective operations. It then follows that once the operation of a company is better optimised, it can become more competitive in the marketplace. The success of any organization depends on its ability to assimilate relevant information into its domain and then use that information in the pursuit of its organisational objectives. The more information it can assimilate and use, the more successful it will become. From the healthcare provider's perspective, the pertinent information will come not only from the organisation itself but also from his paymasters (corporate clients). For example, he does not only need to record his transactions but he must also know relevant information about the patient. Some of this information belongs to the healthcare provider while the rest belongs to the paymaster. If the healthcare provider is able to acquire the relevant information and synthesize this into a coherent body of knowledge, then by applying that body of knowledge into his operations, he will be able to improve his business performance as well as serve his paymasters better. This is what MediNET is about. MediNET allows the elements in the business equation (i.e. healthcare provider and paymaster) to capture relevant data into an information ecosystem, catalogues it into meaningful knowledge and then use it to improve operations efficiency.